Swisher than Stig's driving suit, the ALL NEW new Beer Bike in Amsterdam sports brand new Alloy Wheels, top of the range easy to cycle pedals and more importantly this amazing dream machine can carry more Ale! If you're not au fait with what a beer bike is, then you are about to be educated. 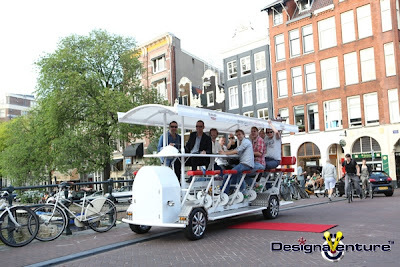 It's 5.40 metres long and can carry up to 17 people, with 10 people pedalling all at the same time, with 30 litres onboard you will struggle to drink the bar dry! When you book with DesignaVenture the beer is included. Luckily for your stag party you have a designated sober driver who picks you up and steers your beer bike along the lively streets of Amsterdam. It has iPod / iPhone connectivity so you need to make a suitable playlist before you get on, no One Direction people! It even has high speed wifi, so if you have full membership of Spotify you are on to a winner. It even has break lights and very smart Alloys.